King Soopers, Golden | Delta Dry Wall, Inc. Typical entry - Structural steel, sheathing, and EIFS in various colors. This store has over 2,000 linear feet of unique shapes on the exterior. These stores, unique in design and style, offer their customers a shopping haven. Quality craftsmanship for a great Colorado company. 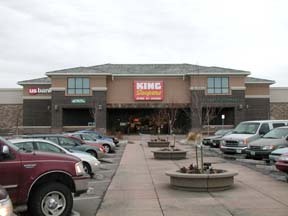 Together with new and remodeled stores, DDW has been part of an incredible King Soopers' team,that has built more than 150 stores.